The procedure is usually performed with local anesthesia and lasts 45 minutes to a few hours depending on how much work is done. Incisions are made along the eyelids in inconspicuous places (in the creases of the upper lids, and just below the lashes on the lower lids). The surgeon removes excess tissue through these incisions and then stitches them closed with fine sutures. In the case that no skin needs to be removed, the surgeon will likely perform a transconjunctival blepharoplasty, where the incision is made inside the lower eyelid and there are no visible scars. Another alternative is for a direct brow lift with the Endotine device. 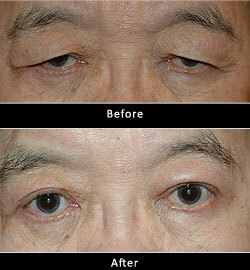 The Endotine is a revolutionary new approach to upper eyelid rejuvenation that is simple, quick and highly effective. It enables us to simultaneously elevate and shape your brow and, if necessary, remove excess eyelid tissue through a single small incision hidden in a fold of your eyelid skin. For more information on Blepharoplasty in Chicago, IL call us at (312) 332-4296 today!